Liverpool Lodge No 1547 was pleased to have Past Assistant Grand Registrar Michael Collins as the principal guest, to their annual installation ceremony at Hope Street. The lodge was first opened in due form by the installing master Colin Svenson, ably assisted by senior warden George Flinn with Roy Cowley as junior warden and the director of ceremonies Jack Parker. On completing the opening business, the lodge admitted Michael Collins and Colin, on behalf of Liverpool Lodge, extended to him a warm welcome and hoped he would enjoy a relaxed and pleasant evening. On this occasion, Michael was accompanied by the Vice Chairman of the Liverpool Group David Johnson, with a number of grand officers and acting Provincial grand officers. Colin Svenson thanked the informal gathering of the ‘Lord Taverners’ for their attendance and then took the opportunity to thank the brethren of the lodge for all their support and assistance during his tenure, it had proven to be a wonderful experience and he knew that the same would be extended to the new and incoming master, Thomas (Tom) Hough. Colin requested Bernie Ashley to honour the lodge by taking the chair as installing master, with Roy Ashley taking the chair of SW, Roy Cowley as JW and John Shaw to act as inner guard. On commencement of the installation ceremony, master elect Tom, was presented by Ken Marshal, before being installed into the chair of King Solomon in fine style. The working tools of each degree were presented in an exemplary manner, with those of a master Mason given by Alan Bresnan, the fellowcrafts by the newest member of the lodge Gareth Rogers and Bernie Ashley completing the set, presented those of the entered apprentice. Later, special mention was given by both Michael Collins and WM Tom, on the exceptional way Gareth Rogers had presented and explained the second degree tools, using the extended version. After the officers for the forthcoming year had been invested, the address to the master was delivered in an exemplary fashion by Roy Ashley, while Derek Horrocks, in a similar manner, addressed the wardens. As is customary, it was the principal guest Michael Collins, who gave the address to the brethren of the lodge. Tom’s first duty as master was a pleasant one, as he presented two cheques to Michael Collins on behalf of the lodge, one in favour of the WLFC for £100, the other to the Liverpool Masonic Hall building fund for £100. The lodge throughout the evening set a sterling example of how an installation ceremony could be shared amongst the members and make them all feel involved, it was an absolute credit to all who took part. After closing the lodge, the brethren moved into the dining room to toast the health of the new master, before sitting down to an excellent festive board. 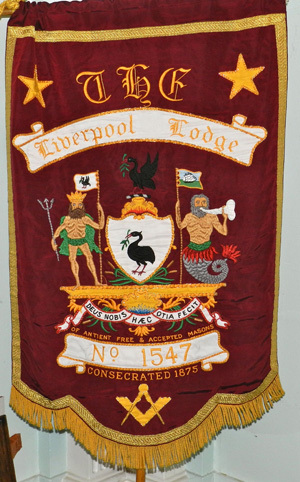 As to be expected, it turned out to be a lively and convivial affair in the best traditions of Liverpool Lodge. It was here that the opportunity was taken by Michael to offer his own personal congratulations to Tom and to wish him and his officers the very best of health and that he may enjoy what he hoped would be a very busy and happy year in office. In addition, Michael made a point of celebrating the work of the outgoing master Colin Svenson, as well as that of Bernie Ashley and the other members who had taken part in the ceremony, particularly the brethren who had presented the working tools. Later in the evening, the master’s song was delivered by the well-known international vocal virtuoso Roy Ashley (well he used to sing at Talacre), accompanied by a chorus of brethren. Colin Svenson later congratulates Gareth Rogers on his explanation of the working tools. Pictured from left to right, are: Martin Cosgrove, Bernie Ashley, Ken Marshall, Gareth Rogers, Colin Svenson and Brian Flood.